Situated in Plant City, this hotel is 2.1 mi (3.4 km) from Robert W. Willaford Railroad Museum and 3.4 mi (5.4 km) from Dinosaur World. Very nice hotel. The rooms and bathroom have been updated and the pool area is nice. The Staff was pleasant. The breakfast was okay and the person making the breakfast wasn't always kind. Our room was for the most part clean but things were missed on a daily basis. I would stay again but would speak up and let management know about my concerns. Staff was polite and nice. Convienent to all stores. 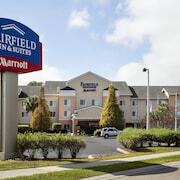 Where to find Plant City hotels near an airport? Where can I find hotels in Plant City that are near tourist attractions? Traveling to Lakeland - Winter Haven? 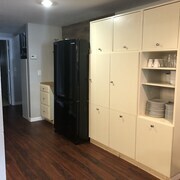 Would you like to book accommodation conveniently located near downtown Plant City? The center of Plant City offers 5 Expedia-recommended apartments and hotels within a 0.1-kilometre (0.06-mile) distance. 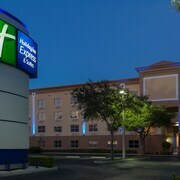 Hotels that are within easy walking distance of the Plant City city center, are the Holiday Inn Express Hotel & Suites Plant City and Comfort Inn Plant City - Lakeland. 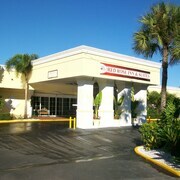 Expedia's extensive database offers just a small selection of economical hotels in Plant City. The Knights Inn Plant City is one of them. The Seminole Hard Rock Hotel & Casino Tampa can be found 25 kilometres (15 miles) from the main part of Plant City. Or, alternatively, the Saddlebrook Resort and Spa is 30 kilometres (20 miles) away. The Residence Inn by Marriott Tampa Sabal Park/Brandon and the Residence Inn by Marriott Tampa North-Fletcher Avenue are two other places to stay in Plant City. If you intend to enjoy more of the wetlands in this region of United States of America, you may choose to plan extra time in other parts of Central Florida. Whether you engage in popular local activities, such as hiking and picnicking, or travel around to explore the area's offerings you will be able to find comfortable hotel accommodation in the area. 35 kilometres (22 miles) to the southeast of Plant City is Bartow, where you can spend the day exploring Bartow Flea Market and Polk County Historical Museum. 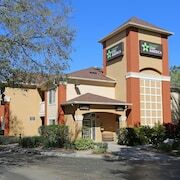 The Holiday Inn Express Bartow and Stay Inn and Suites are a few of the accommodation options in Bartow. 55 kilometres (34 miles) to the east of Plant City, you'll find Lake Wales, which is home to the Hampton Ste Lake Wales and Green Gables Inn. The Eagle Ridge Mall and Bok Tower Gardens are a couple of the most popular places to explore when you're in Lake Wales. If you enjoy sports and love watching games you might decide to head to Arcadia Rodeo Arena, which is 95 kilometres (58 miles) to the south of Plant City. For those who are keen on sleeping nearby, make a reservation in the Holiday Inn Express Hotel and Suites Arcadia or Knights Inn Arcadia. 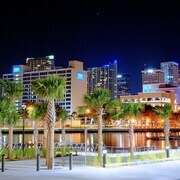 Tampa International Airport is located 40 kilometres (25 miles) from Plant City. Should you choose to stay nearby, you can easily book a room via Expedia at the Tampa Airport Marriott or Westin Tampa Bay Hotel. 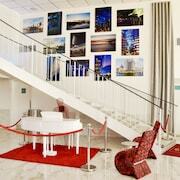 What are the most popular Plant City hotels? Are there hotels in other cities near Plant City? What other types of accommodations are available in Plant City? Explore Plant City with Expedia.ca’s Travel Guides to find the best flights, cars, holiday packages and more!